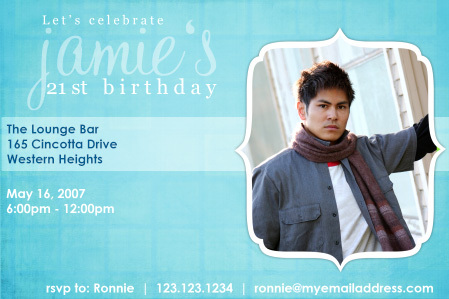 This trendy 21st invitations is just what you want for your milestone birthday event. A slightly tile textured background is colored in shades of blue and has a grungey feel to up its cool factor. Your photo will be framed and can be colored, b+w or sepia. The wording and colors are customizable and the invitation can be ammended to suit any birthday age. Available as a "print it yourself" 4"x6" or 5"x7" jpeg file.